Today we are at Grezzo1 in Shibuya, Tokyo for a session of “Iwata Asks” with the production staff of The Legend of Zelda: Ocarina of Time 3D2. Thank you for taking the time today. 1GREZZO Co., Ltd.: A video game developer with its head office in Shibuya Ward, Tokyo. 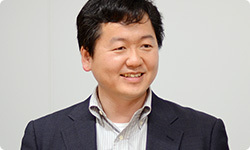 Mr. Koichi Ishii is CEO. 2The Legend of Zelda: Ocarina of Time 3D: An action-adventure game released for the Nintendo 3DS system on June 17, 2011 in Europe. Alright, let’s start with self-introductions. I’m Koichi Ishii from Grezzo. I was development producer. Thank you for coming today. I’m Takaaki Tonooka from Grezzo. I was a manager and programmer. Nice to meet you. I’m Shun Moriya, a programmer at Grezzo. Pleased to meet you. 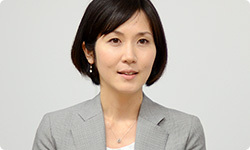 I’m Nagako Ikuta from the Software Planning & Development Department at Nintendo. I worked as Grezzo’s contact at the software development department. 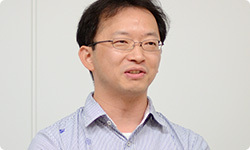 I’m Takao Shimizu from the EAD Tokyo Software Development Department at Nintendo. I made all sorts of arrangements to facilitate Grezzo’s development effort, such as keeping them abreast of the newest information regarding the Nintendo 3DS system. 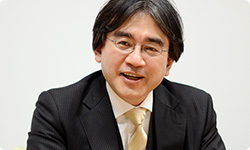 This is my third “Iwata Asks” in a row! 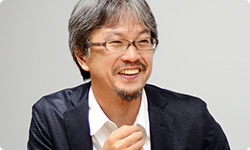 I’m Eiji Aonuma, producer of The Legend of Zelda: Ocarina of Time 3D. I’m the one who placed a burden on everyone to satisfy my desire to remake the Water Temple.3 (laughs) 3Water Temple: A challenging dungeon that appears in The Legend of Zelda: Ocarina of Time. Alright, thank you. 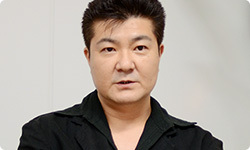 Nintendo asked Grezzo to take care of the production of The Legend of Zelda: Ocarina of Time 3D. When we thought about releasing The Legend of Zelda: Ocarina of Time for the Nintendo 3DS system, it was like fate how all the conditions pointed toward Grezzo, so I spoke directly with Ishii-san. 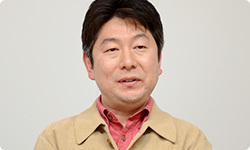 Ishii-san, could I ask you to start by telling me how the plan for The Legend of Zelda: Ocarina of Time 3D began? Yes. At first, I didn’t know anything when you called me in. Right. I said, “I need to talk with you, so please come to Kyoto,” like I was giving you a summons. (laughs) That wasn’t how I intended it, though. Sorry if I made you nervous. No, not at all. (laughs) But I hadn’t heard anything beforehand, and the atmosphere suggested it was something top secret. To be honest, I had a hunch it might be about new hardware. You have good instincts then. One reason I did need to have you come to Kyoto was so you could see the Nintendo 3DS system, which was still under development. When I saw the Nintendo 3DS system in Kyoto and heard about The Legend of Zelda, it was like a bolt from the blue! We revealed Nintendo 3DS and brought up the new Zelda idea to you at the same time. Yes. To be honest, when I heard that, I thought, “This is a great opportunity!” and “Uh-oh...” at the same time. Fans the world over love Ocarina of Time and it is one of Nintendo’s foremost titles, so one false step could damage the brand. And lots of people have their own idea of what the game was like. Lots of people talk about their memories of it. Yes. I often compare making video games to cooking. If game developers are like cooks, then the games they make are like food. Just as the techniques of the cooks influence the way their food tastes, the techniques and experience of game developers appear in the games. So I thought it would be a failure as a product if people who made the original game weren’t involved, thereby causing it to turn out as something that was merely somewhat like the original game, something that looked the same but tasted different. I felt like an important theme this time was how we could make The Legend of Zelda: Ocarina of Time today. This is going way back, but what was your first impression of the Nintendo 3DS system? At first, I felt a joy as if I had returned to my boyhood. It was surprising to survey the game world as if it were really there, spreading out before me. Tonooka-san, you were there that day, too. Oh? (laughs) How did the rest of you react? Ever since establishing Grezzo, one of our goals has been to be involved with development of software for hardware that hasn’t been released yet. So everyone was filled with surprise and excitement because we could make it ourselves. It was like a dream come true. But it must have been hard to develop a game for hardware still under development. What was that like for you as programmers, Tonooka-san and Moriya-san? First of all, whatever we did, it was all without prior example, so we went through an intense process of trial and error. But it really helped that Shimizu-san fed us every bit of new information about the Nintendo 3DS system. I have meetings in Tokyo and Kyoto every week, so I conveyed the information I got there to Grezzo so they could make their product. I mostly felt lucky to be involved with hardware based around such a novel concept as 3D. As I was working on it, I realised what a high degree of freedom exists in The Legend of Zelda: Ocarina of Time. Each person has their own way of solving the challenges posed by the game. For example, take the scene in which you set a spiderweb on fire. Video: Lots of people, including me, have Link roll forward or swing his torch to light it, but some people use how the tip of the torch lowers when he is holding the shield. Today we are at Grezzo 1 in Shibuya, Tokyo for a session of “Iwata Asks” with the production staff of The Legend of Zelda: Ocarina of Time 3D 2 . Thank you for taking the time today. 1 GREZZO Co., Ltd. The ways to solve that challenge are stuck in the players’ memories, so you have to recreate those too. Right. When I looked into why the tip of the torch wouldn’t light the fire, I realised that Link’s arms and legs were longer and his waist higher, since we had designed him a little more to today’s styles. This had caused the angle between his sword and the ground to change, so the tip of the torch wouldn’t light the fire. You wanted to update the game, but when you did, certain elements fell apart. Right. During development, we talked frequently about what we could do to fill in the 13-year gap since the original game was released. A mere port would reduce the product’s appeal by half. Ikuta-san, how were you involved? I worked to make sure information flowed between Nintendo, Grezzo and the Mario Club.4 Actually, I volunteered to be in this project! (laughs) 4Mario Club Co., Ltd.: It conducts debugging and testing of Nintendo software during development. Ikuta-san is extremely into The Legend of Zelda: Ocarina of Time. If you ask her about The Legend of Zelda, a flood of opinions pours forth! She’s a walking dictionary of Zelda lore! (laughs) Does she know more than you, Aonuma-san? Yes, I think so. You could say she’s a walking specifications manual! (laughs) We used her impressions to check whether what players of the original game experienced was present in the new one.